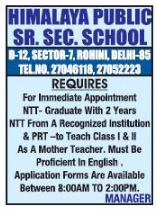 Himalaya Public Sr. Sec School, New Delhi has advertised in THE HINDUSTAN TIMES newspaper for the recruitment of Teachers- NTT / PRT jobs vacancies. Interested and eligible job aspirants are requested to apply immediately from 02nd October 2018. Check out further more details below. About School: Tandon Educational Society was founded on 29 May 1986 by eminent educationists with a view to set up ideal Public School in Delhi to provide education to younger generation from Pre-Primary to Senior Secondary Level in the name of Himalaya Public Sr. Sec. School. Recognition was granted to Himalaya Public Senior Secondary School. Recognition was granted to Himalaya Public Senior Secondary School by Directorate of Education Delhi and it was affiliated to All India Central Board of Secondary Education. New Delhi up to +2 Level in Science, Commerce & Arts Streams of Subjects.